I chose the Kenmore Elite 41582/81582 pair because they seemed to have the most positive reviews for their price tier and because Sears had a good promotion on them this Memorial Day weekend. So, here we go: now that these machines are in my house and I’ve put them through a dozen loads, I feel comfortable telling you how awesome they are! This washing machine is quiet. 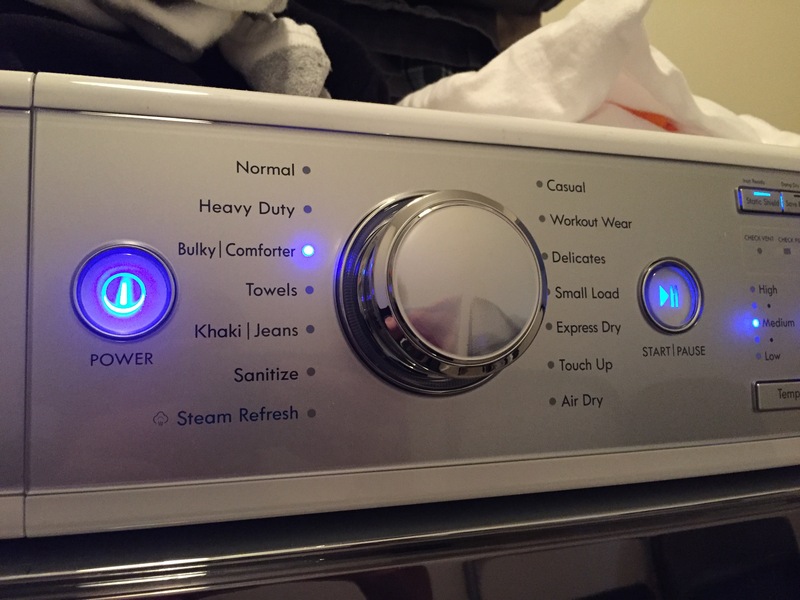 It also has a button for toggling the “done beep” volume: loud, normal, and off (this is also true of the dryer). The first few times I ran the washer I could not even believe it was running. My machines are in a room (with a real door, not a louvered door) next to my living room, so I had ample opportunity to hear (or not hear) them in action. I made these videos to demonstrate just how quietly these machines run. The vast majority of a cycle is just washing/tumbling the load. 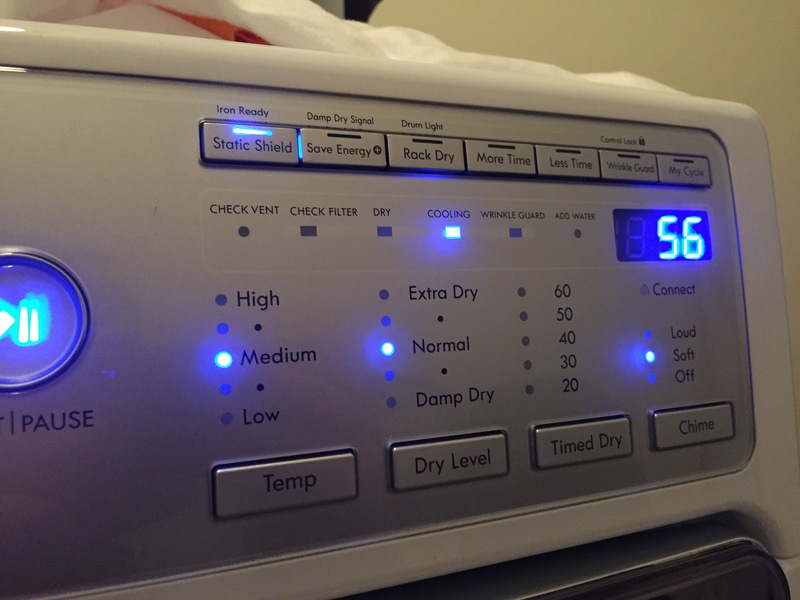 Notice the machine doesn’t get thrown off balance by the uneven load, and the amount of water/soap is appropriate for the size of the load (a normal size pillow, two pillow cases, and four shirts). My previous machine was a HE top-loading agitator-less machine that would make a repetitive grinding noise as it cycled laundry in and out of the water, so this gentle hum seems very quiet by comparison. It’s even quieter with a normal load (not a pillow flopping around). The last 2 minutes of the spin cycle is the loudest thing I’ve heard this machine do, and honestly, I think it comes off louder in the video than it does in real life. While I was researching machines, it was hard to find information on how noisy various machines are, or how annoying those noises might be. 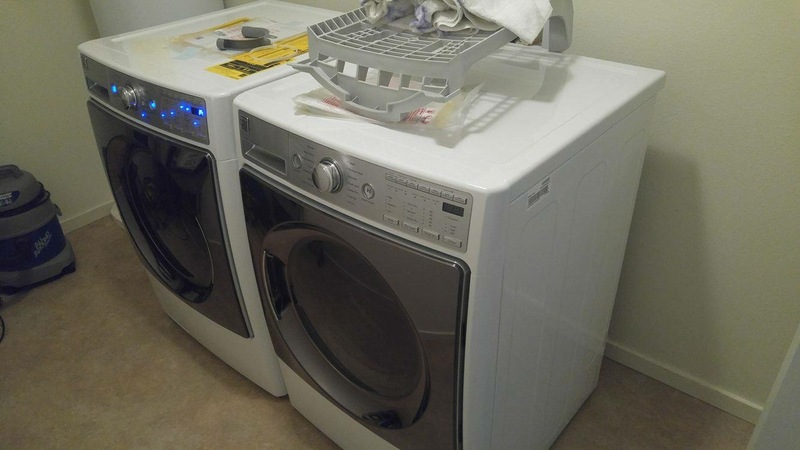 My previous home had a set of 2010-era Maytag Bravos machines (top loading HE washer) and the washer was so loud and annoying. It went vrrm vrrm vrrm vrrm vrrm as it moved laundry in and out of the pool of water at the bottom of the wash basin, and the repetitive noise drove me nuts. I often started laundry and the left the house for some errand so I wouldn’t have to listen to it. The drum capacity is 4.5 cu feet on my model, and there’s also a larger version (5.2 cu feet). My big plushy queen-size comforter fits inside both washer and dryer with room to spare. My city apartment has a compact washer and dryer, so it’s pretty nice to blow through a ton of laundry in just a few big loads. You don’t have to do big loads, though – there’s a setting for “small load”, too. The buttons on this machine are straightforward: rotate the knob to select your load type, toggle any settings you want to be particular about, and hit the play button. Use the buttons at right to set temperature, spin speed, soil level, and beep volume. The “—” is where “time remaining” for the current load displays. 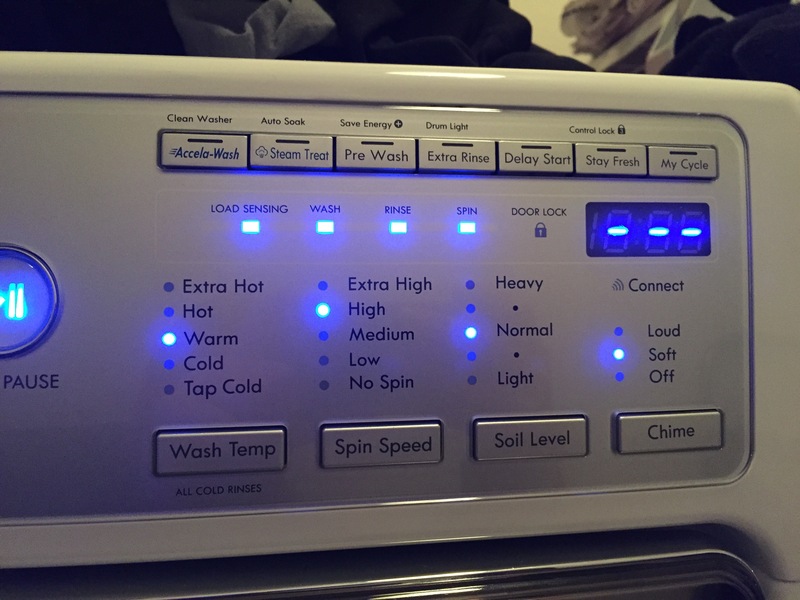 Same idea as the washer, turn the dial to choose a mode. Without “Static shield” on, the first couple loads came out really clingy. Once we turned this setting on, that problem went away. I have had a particular big, fluffy queen-size comforter for at least 15 years and I’ve washed it in more machines than I can remember. I sent it through a wash and a dry cycle in the Kenmore Elites. It was pretty dry at the end of the washer’s spin cycle and didn’t throw the machine off balance or reach the end of the cycle with suds still in the tub (both common problems I’ve had with other washing machines in the past). It took just one dryer cycle to dry it, not two or more like some older machines have required. Likewise, I have a large fluffy pillow that I’ve had for a few years now. It is notorious for throwing agitator-style washing machines off balance, but the Kenmore Elite handled it just fine (I washed it on “Bulky”). The washer even did a good job of spinning most of the moisture out of it. It took one and a half dryer cycles to dry it (I ran it on “Bulky”). These are fantastic laundry machines. It’s hard to know how many years you’ll get out of a newly purchased appliance, but if I run into any trouble I’ll come back and update this review. Kenmore changes its line frequently, but if you’re reading this from the future there’s a good chance that the Kenmore Elite line has only gotten better since this article’s creation in May 2016.